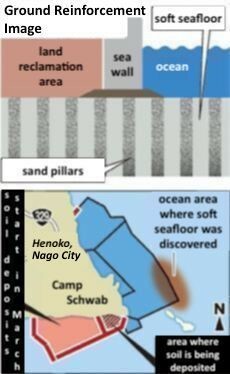 On January 31, it came to light that the Japanese government is considering using approximately 60,000 sand pillars at a depth 70 meters under the water of Oura Bay as the soil improvement method on a 57-hectare area of soft seafloor in the land reclamation area for the Futenma relocation site in Henoko, Nago City. 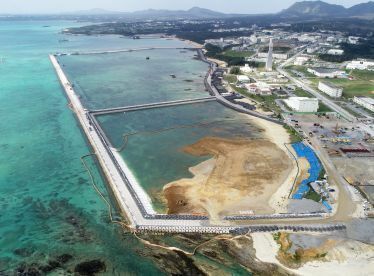 At the end of last year the Okinawa Defense Bureau (ODB) announced to agencies including the Ministry of Land, Infrastructure, Transport and Tourism (MLIT) and the Okinawa Prefectural Government (OPG) that it estimated a total of 40,000 pillars for ground reinforcement. Out of the 40,000, 20,000 would be used under a portion of seawalls, and the other 20,000 would be used in a land reclamation section. However, additional boring surveys in the area found that further reinforcement will be necessary. Since the beginning of this year the estimated number of sand pillars needed has increased to 60,000 in total. Toward using this kind of soil improvement method on the soft seafloor, on January 31 Prime Minister Shinzo Abe answered inquiries at a plenary session of the House of Representatives. This is the first time someone representing the administration has mentioned the intention to apply for authorization from the OPG on a revised construction plan. With these words Governor Tamaki called for a halt to construction, indicating that he does not intend to authorize the revised construction plan. In the report drawn up by the commissioned vendors for the soil improvement work being considered by the Japanese government, there is mention of the method that may be used in Oura Bay. The report itemizes 60,000 sand pillars as part of a technique called the “sand compaction pile method,” in which sand pillars are powerfully compacted into the ground using a casing pipe, which will increase the density of the seafloor. About 40,000 sand pillars are to be used in this method for the seawall portion. About 17 hectares of the seawall area and about 40 hectares of the land reclamation area are up for soil improvement. Reinforcement on each area is expected to take place at a depth of 70 meters underwater. In regard to the use of an estimated 40,000 sand pillars for the plan in Decemeber last year, a central government employee said, “There will be full-blown examinations after this, so the actual number of pillars is still unclear. On January 30, Prime Minister Shinzo Abe for the first time stated his administration’s view that the existence of soft seafloor on the Oura Bay side of the land reclamation area means that ground reinforcement is necessary. At that time he did not touch on the topic of an application for the revised plan.